Supernovae are stars that explode with the energy of a few thousand atom bombs. Since the morning of February 11, 1989, when Insight Observatory science writer, Dale Alan Bryant and I independently discovered supernova 1989b, I acquired a passion for extragalactic supernova search. Not long after that inspiring morning, I purchased the Supernova Search Charts and Handbook by Gregg D. Thompson and James T. Bryan Jr. to compliment my telescope for this endeavor. This unique atlas contains 236 charts of more than 300 of the brightest galaxies, each specifically prepared to facilitate the discovery of supernovae. The comparison of these charts with the field seen in a telescope enables any extragalactic supernova to be spotted immediately. The charts include 345 galaxies printed on translucent paper for use on a lightbox, each one carrying an explanation of the constellation in which the galaxy lies, special characteristics of the galaxy, observing instructions, expected maximum brightness for the supernovae in each galaxy, and the reference for the sequence. Of course, this tool was ideal in the days before CCD imaging technology was readily available to amateur astronomers. I would observe a handful of the brighter galaxies using this atlas with my 6" Newtonian reflecting telescope and a few years later with my 10" telescope. Although after years of searching and never spotting a supernova again, the nights of observing these galaxies were priceless as I was able to observe their unique characteristics that would make it easier to find one. It would take many clear nights and hours to pursue such a project back then. However, with the current technology of the Internet and CCD imaging, there is a way to search for extragalactic supernovae from the comfort of your own home and a personal computer. A program created through Zooniverse.org called Supernova Hunters allows you to do so at your leisure. To be a supernova sleuth, you simply sign up on their website to become an observer. The website walks you through the process of analyzing the data of galaxies that could have potential suspects. I recently signed up for an account and started analyzing galaxy data immediately. With Supernova Hunters you can aim to discover lots of new explosions and pass them on to the wider astronomical community. But finding supernovae isn't easy. You can expect to observe about one supernova per galaxy every few centuries. So to find lots of supernovae, Supernova Hunters need to look at many galaxies at once. Pan-STARRS1 is great for this. Due to the large camera, the telescope has a field-of-view that covers the same area as the full moon. This allows the telescope to scan large areas of the sky each night imaging many galaxies. Supernovae are also extremely bright and can outshine all the other billions of stars that make up their galaxy. This means that observers can discover distant supernovae even if we don't see the galaxy hosting the supernova. Where does the image data of the galaxies come from? - On the island of Maui in Hawaii, the Pan-STARRS1 telescope is scanning large areas of the sky each night trying to do just that. Using a process called difference imaging they look for anything that has changed by comparing each night's data with high-quality reference images of the same area taken a few years ago. 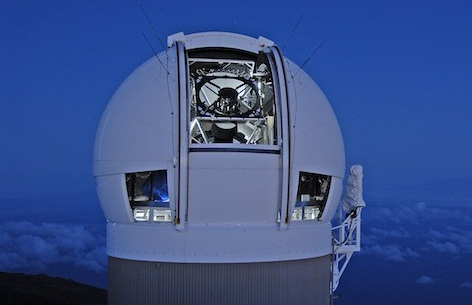 Pan-STARRS, the Panoramic Survey Telescope and Rapid Response System, an innovative design for a wide-field imaging facility were developed at the University of Hawaii's Institute for Astronomy. The combination of relatively small mirrors with very large digital cameras results in an economical observing system that can observe the entire available sky several times each month. How do stars evolve? How fast is the universe expanding? How far away are the galaxies we observe? These are some of the questions that are hoped to be answered by studying supernovae. Supernovae are explosions lasting a few weeks to several months which we hope to discover new sources of light that have appeared since the reference image was taken. But their current software makes much bogus detection of supernovae. These are image artifacts due to the electronics in the camera or image processing that have gone wrong. Currently, computers aren't very good at telling the difference between the real and bogus detections. You can help improve our understanding of supernovae and improve our detection algorithms by classifying detections as real or bogus. The National Aeronautics and Space Administration currently support the operation of the Pan-STARRS1 telescope with a grant issued through the Near Earth Object (NEO) Observation Program.